Back in May I wrote how the ink lettering on the labels in the dahlias I’d planted had vanished, soaked away into the cheap coffee stirrers I’d used as markers. As a result I had to employ a bit of guesswork when it came to placing out some of the dahlias, not quite sure how they were all going to settle in together. Well I’ve been well and truly caught – not only is ‘Summertime’ not the gentle pale lemon I’d been anticipating – more highlighter pen dayglo yellow, but it ended up slap bang next to some magenta and lavender coloured Phlox – it was a game of Russian roulette that I did not win! Anyway, it has now been relocated to the relative safety of my white border at the end of the garden, where the soothing tones of the ‘Swan Lake’ dahlia next to it provides a calming influence, and it can glow away to its heart’s content. 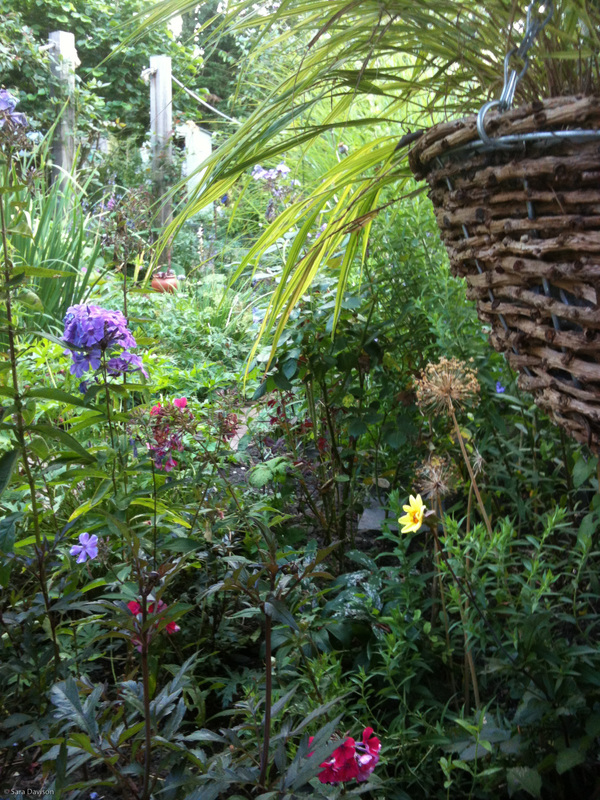 This entry was posted in Creating my garden and tagged dahlias, gardening, summer colour. Bookmark the permalink. Sadly the three dahlias that I planted this year got eaten by slugs. I didn’t get round to planting dahlias in the garden this year, but by sheer luck one self seeded (??) on the allotment, so an absolute bonus ! !